The average cost of memory care in Washington County is $4,882 per month. This is higher than the national median of $4,650. Cheaper nearby regions include Sullivan County with an average starting cost of $3,896. There are almost 55,000 people who call Washington County, Virginia home. Of those people, more than 22 percent are seniors aged 65 or older, many of whom are living with Alzheimer's Disease, which affects an estimated 150,000 seniors in Virginia. There are two memory care facilities in Washington County that provide residential care and support to seniors with dementia. These facilities are subject to similar rules as assisted living facilities and as such, both facility levels are often housed at the same location. The Virginia Department of Social Services regulates all memory care and assisted living facilities in the state. The Washington County area is home to world-class medical facilities, including those that specialize in brain health and dementia care such as Johnston Memorial Hospital, in the event of medical emergencies or illness. Virginia's tax laws are very retirement-friendly. The state doesn't tax social security income and all other forms of retirement income are eligible for generous tax deductions. Families on limited budgets can consider using these savings towards the cost of memory care. Washington County has higher violent crime rates than the average U.S. city. On a scale of one to 100 where one represents low crime and 100 represents high crime, Washington County has a violent crime rate of 36.7, while the national average is only 31.1. It's important to discuss safety with memory care facilities and make sure there are security systems in place to protect residents from crime. Washington County has more rainfall annually than the average U.S. city. While the average city has only 39 inches of rain each year, Washington County has 46 inches. This may limit outdoor time for seniors living in memory care facilities. Regardless, it's important to make sure that all time spent outdoors is supervised by memory care staff. Memory Care costs in Washington County start around $4,882 per month on average, while the nationwide average cost of memory care is $4,778 per month. To see a list of free memory care resources in Washington County, please visit our Assisted Living in Virginia page. 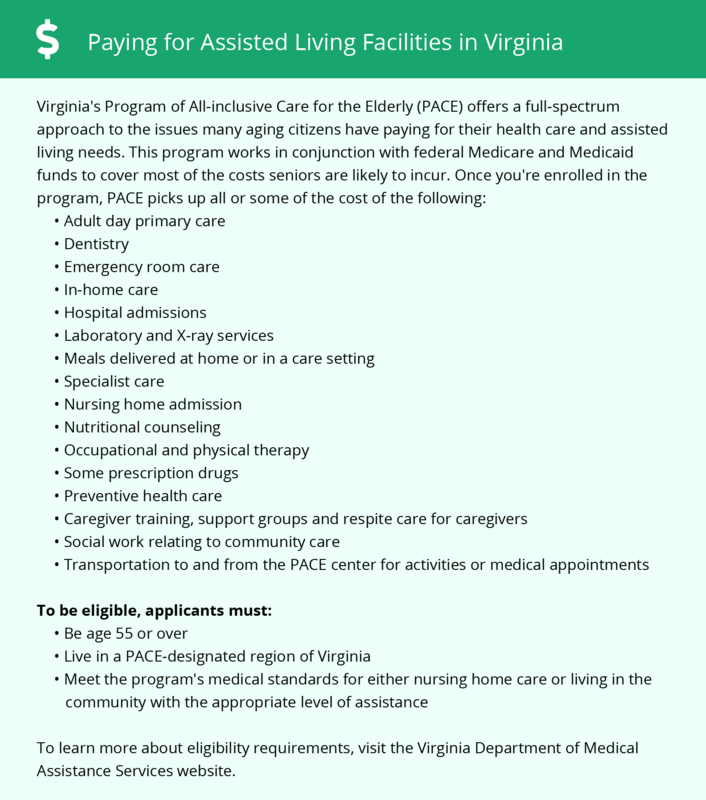 Washington County-area assisted living communities must adhere to the comprehensive set of state laws and regulations that all assisted living communities in Virginia are required to follow. Visit our Memory Care in Virginia page for more information about these laws.